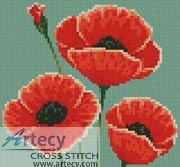 Reviews: Mini Poppies Counted Cross Stitch Pattern to print online. I love the mini patterns! This one has been really fun to work on and is turning out beautifully. The colors and detail in person are much better than I expected from the mock up picture. I was a little unsure about the background color in the mock up picture, but the actual thread color is gorgeous and matches the poppies well.